SATURDAY MORNINGS FOREVER: SATURDAY SUPERCADE: PITFALL! In 1979, game developer David Crane came up with the technology that could display a realistic running man in a video game. Searching for a suitable game to use it in, Crane sat down with a piece of paper and ended up scribbling down a stick figure man running through a jungle collecting treasures and avoiding enemies. That simple idea became the basis for Pitfall! The player controlled Pitfall Harry as he ran through a maze-like jungle to collect 32 treasures comprised of bags of money, gold and silver bars and diamond rings within a set time limit. Meanwhile, Harry had to avoid numerous obstacles such as pits, quicksand, rolling logs, fire, snakes, scorpions and crocodiles, by jumping over them, climbing, or swinging on vines (which was accompanied by a Tarzan-like yell sound effect). Points would be lost whenever Harry fell into a hole or hit a log, and a life with every other peril. Activision released the game on April 20, 1982 for the Atari 2600. The technical achievements of Crane’s programming meant that multiple animated sprites could appear on the screen without causing any flickering on the otherwise primitive graphics hardware. The game was a hit, spending 64 weeks as a #1 best-seller and receiving high praise for its graphics and gameplay; often credited with creating the side-scrolling genre (even though it didn’t actually scroll). It was even awarded “Best Adventure Video Game” in the 4th annual Arkie Awards. The game was subsequently ported to the various gaming systems available at the time and went on to sell over 4 million copies throughout the 1980s. Around the time of the game’s release, CBS was looking to get in on the video game craze and to combat ABC’s Pac-Man produced by Hanna-Barbera. Figuring to hedge their bets, they licensed several gaming properties and commissioned former Hanna-Barbera employees Joe Ruby and Ken Spears to handle it through their company Ruby-Spears Productions. The resulting series was Saturday Supercade. Harry with Rhonda and Quickclaw. Making up the Supercade every week were segments based on Frogger, Donkey Kong and Donkey Kong Jr., while Pitfall! alternated its slot with Q*Bert. As in the game, Pitfall Harry (Robert Ridgely) navigated the many perils of the jungle as he searched for all kinds of treasure. 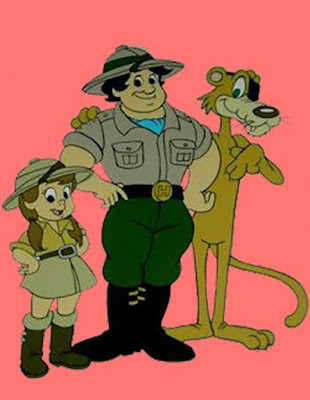 Joining him were the newly created characters of his adventure-seeking niece, Rhonda (Noelle North), and their eyepatch-wearing cowardly pet mountain lion, Quickclaw (Kenneth Mars). Ken Boyer and Patrick A. Ventura served as Supercade’s character designers and fleshed out Harry from his pixelated blocky form. Harry and Quickclaw hanging out with Donkey Kong. Pitfall! debuted with the rest of Supercade on September 17, 1983. It had the shortest run of all the featured segments, topping out at only seven episodes. When Supercade was renewed for a second season, Pitfall!, along with Frogger and Donkey Kong Jr., were dropped in favor of new segments Space Ace and Kangaroo. Before Pitfall!’s cancellation, work had begun on the 1984 sequel to the game, Pitfall II: Lost Caverns. The game was the last major release for the Atari 2600 and featured further technological advancements by Crane; such as a soundtrack and 27 horizontal levels. Included in the game were the characters of Rhonda and Quickclaw, both of whom needed to be collected in order to win the game. Like the earlier game, Pitfall II was ported to additional systems. The Atari 5200 and 8-bit versions were called Adventurer’s Edition due to the extra level added by designer Mike Lorenzen, while the Famicom (the Japanese name for the Nintendo Entertainment System) got a loose remake called Super Pitfall. In 1985, Sega licensed the game to create an arcade version, which was actually a combination of both Pitfall games with better detailed graphics. The Quickclaw name was later reused for a jaguar included in the sixth and final Pitfall game, 2004’s The Lost Expedition (known as The Big Adventure on Nintendo Wii). “Pitfall’s Panda Puzzle” (9/17/83) – NO SYNOPSIS AVAILABLE. 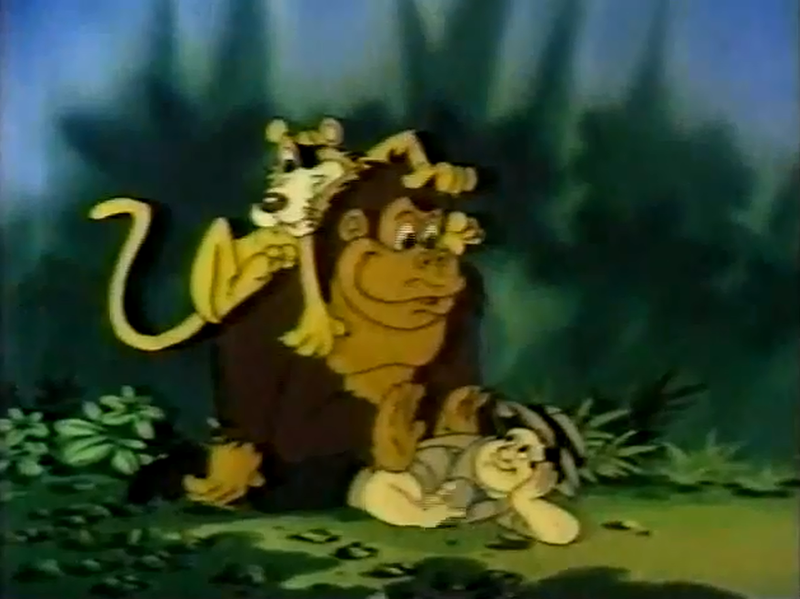 “Amazon Jungle Bungle” (9/24/83) – NO SYNOPSIS AVAILABLE. “Raiders of the Lost Shark” (10/8/83) – NO SYNOPSIS AVAILABLE. “Tibetan Treasure Trouble” (10/22/83) – NO SYNOPSIS AVAILABLE. “Masked Menace Mess” (11/5/83) – NO SYNOPSIS AVAILABLE. “The Sabretooth Goof” (11/19/83) – NO SYNOPSIS AVAILABLE. “The Pyramid Panic” (12/3/83) – NO SYNOPSIS AVAILABLE.